One way to make winter days more bearable is to look through pictures taken on sunny summer days. These are some of the iris that bloomed in our yard during the late spring of 2008. 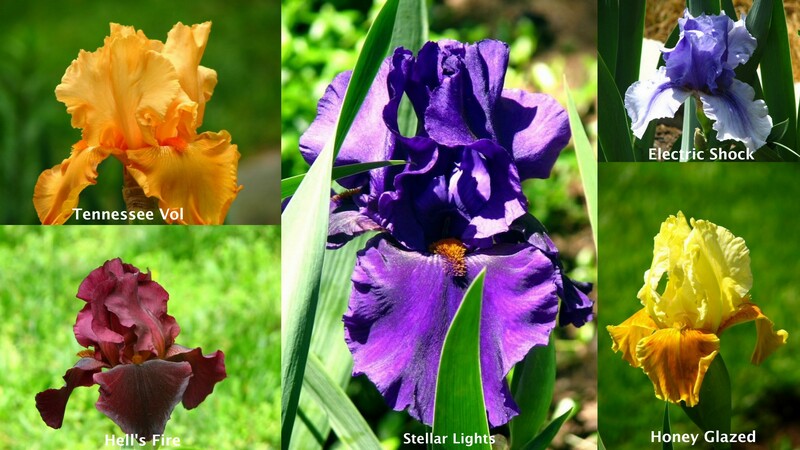 We have more roses than iris, but we do enjoy the iris which bloom earlier than the roses. Our side flower bed under a blanket of snow. Fairfield Glade, Tennessee. February 19, 2012. (Photo by Betsy). Betsy took the picture above this past Sunday. These are some of the spring flowers that shot up during our mild winter. 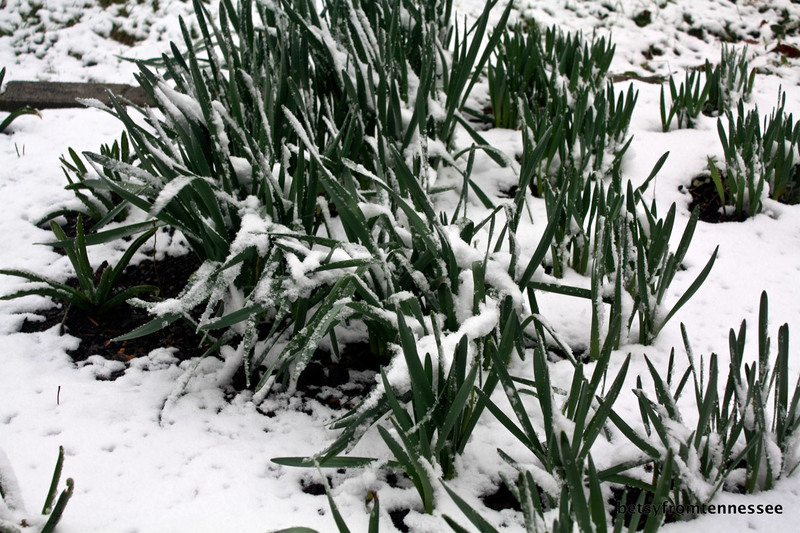 Of course now that they are sending up flower stalks, we get snow and cold! But one thing about Tennessee weather is that if you don’t like it stay around for a day — it will change. Crocus in our side flower bed, Fairfield Glade, Tennessee. February 21, 2012. This picture was taken on Tuesday. 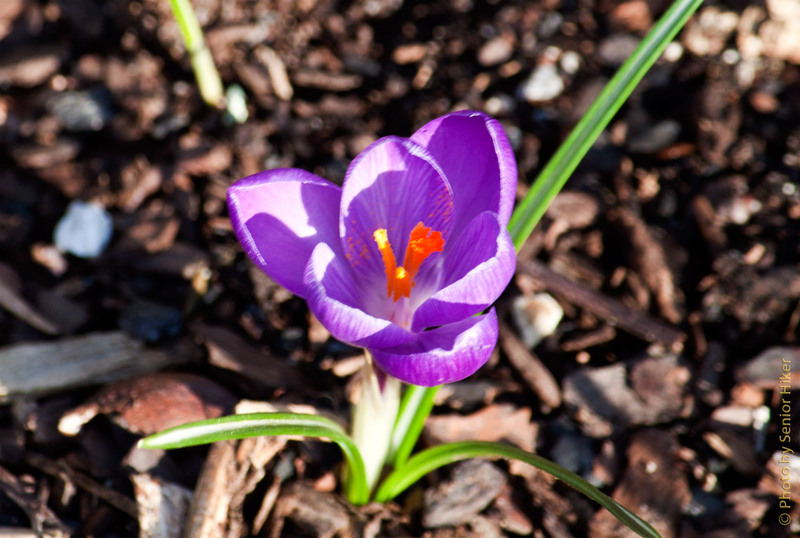 The snow is gone and we have a crocus in bloom. 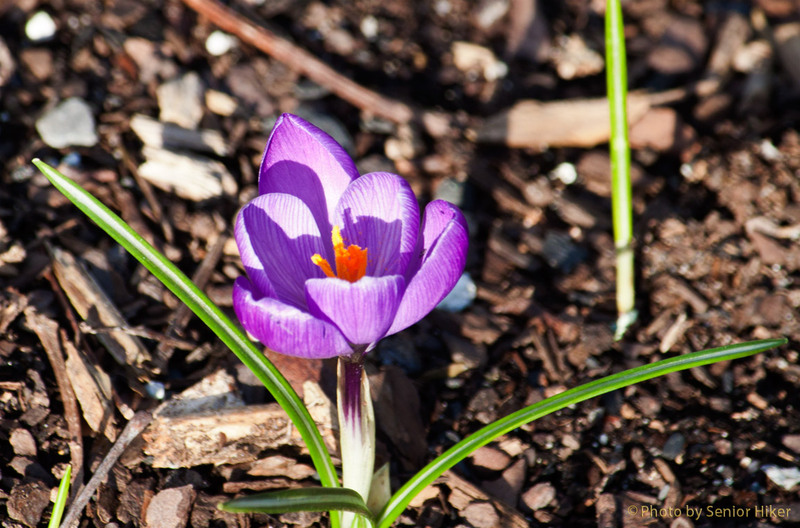 I actually saw a crocus in bloom before the snow storm, but I didn’t get a picture. It didn’t survive the storm. It rained most of Wednesday, and just after dark the warning sirens here in the Glade went off. Fortunately all we got was more rain. Crocus in our flower bed. February 21, 2012. 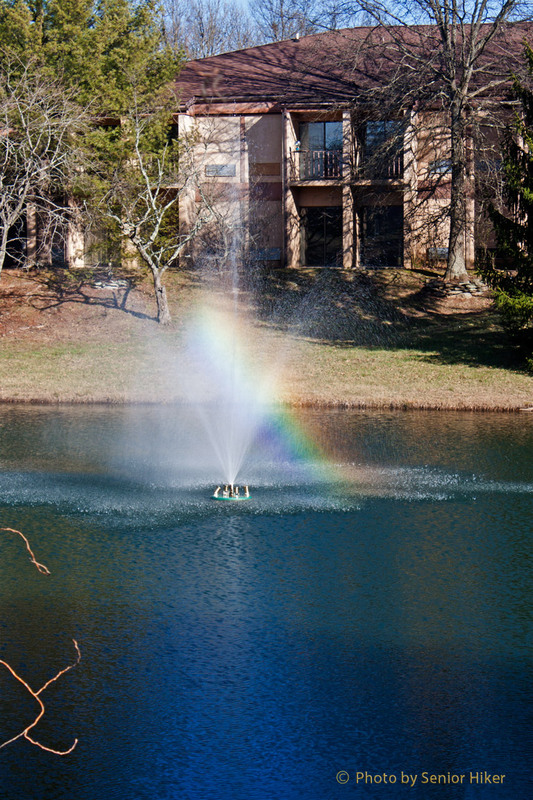 Yesterday was a bright, warm, sunny, Spring-like day. I can hardly wait to see what today brings. Betsy and Mrs. P at Wetumpka Falls, Tullahoma, Tennessee. February 9, 2012. 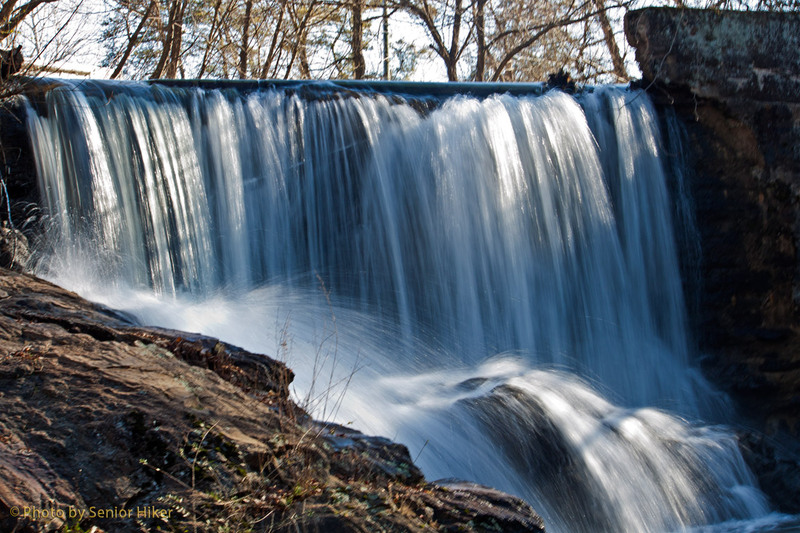 A couple of weeks ago Betsy and I took Dad for a ride with us as we checked out a couple of waterfalls in the Tullahoma, Tennessee, area. 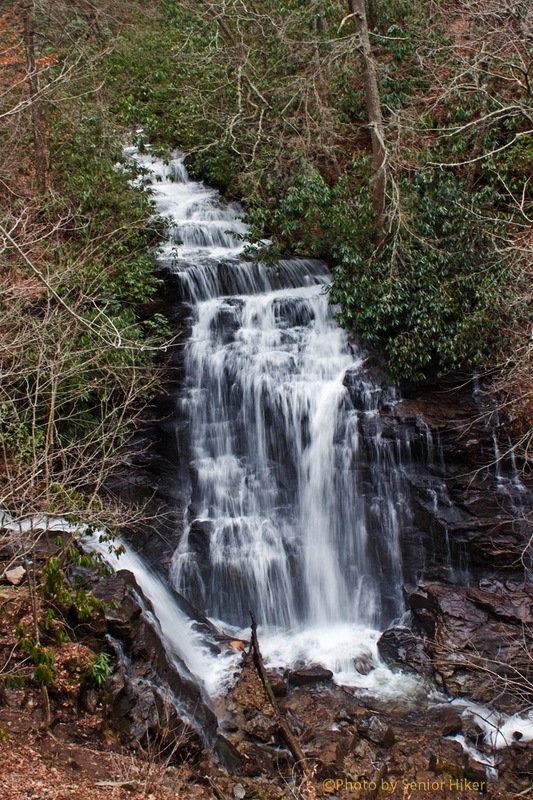 One of the waterfalls we visited was Wetumpka Falls northwest of town. This picture was taken at Wetumpka Falls, and shows the women in my life. Betsy needs no introduction to readers of this blog. 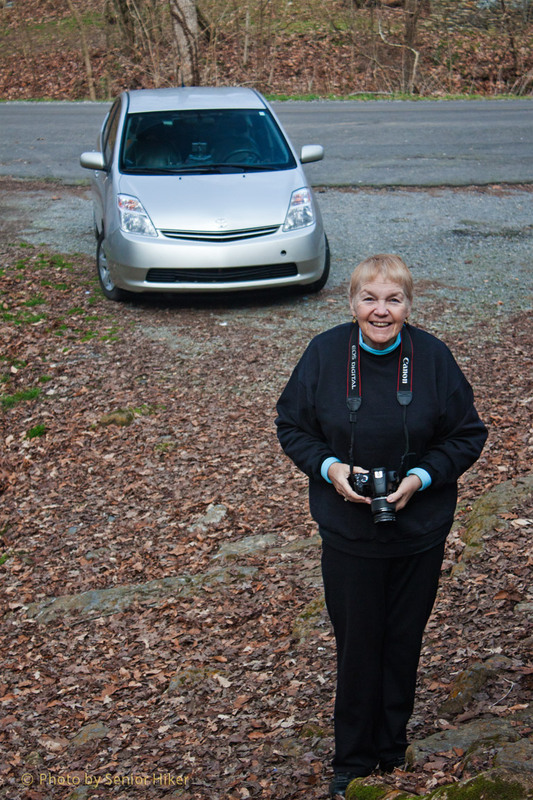 Behind her is our Prius, affectionately known as Mrs. P. If you look closely on the dash of Mrs. P, you can make out our GPS unit, Miss Barbeak. It seems to me that at least one of these women is always telling me where to go! 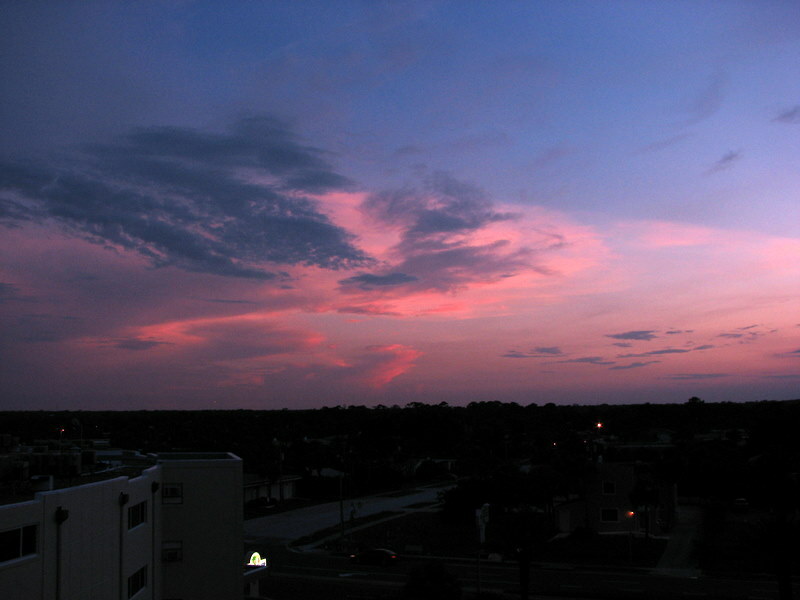 The western sky shortly after sunset, Ormond Beach, Florida. August 4, 2009. We celebrated Betsy’s birthday in 2009 at Ormond Beach, Florida. We had a room that looked out over the ocean, but I captured this beautiful sky photo by going to the other side of the building and shooting the western sky shortly after sunset. The landscape may not be as pretty as the ocean, but the sky couldn’t be any more glorious. 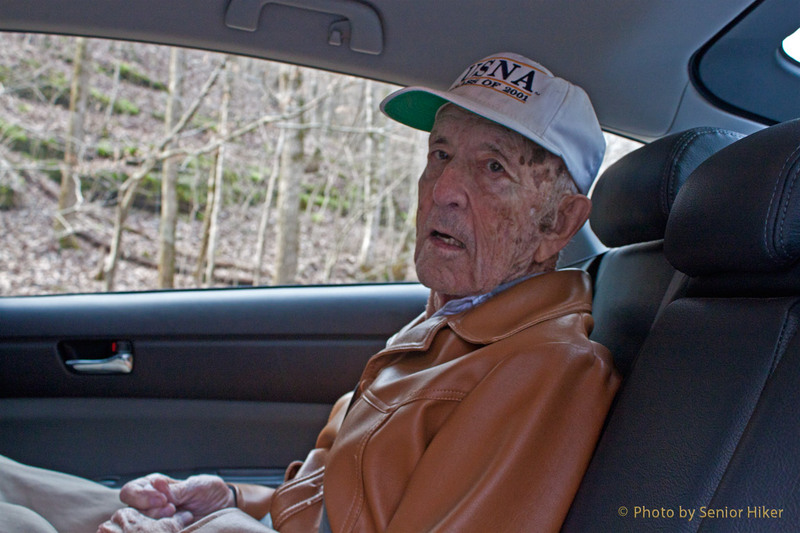 Dad in our car visiting waterfalls, Tullahoma, Tennessee. February 9, 2012. This past Thursday Betsy and I went down to Tullahoma to see Dad. After helping him with some things around the house, we went out to lunch and then went for a ride. Dad is legally blind, but he enjoys drives out into the countryside, so we took him along to visit a couple of waterfalls in the area. He stayed in the car while Betsy and I were getting pictures of the waterfalls. But since he was with us, I convinced him that I needed to get his picture as well. Dad was more feeble when we saw him this time than he has been at other times, but since he’s going to be 100 in August that is to be expected. He enjoyed being with us, just as we enjoyed being with him. About the hat — one of Dad’s grandsons (my nephew) graduated from the Naval Academy in 2001 and gave Dad the hat, which he wears just about every time we go out. 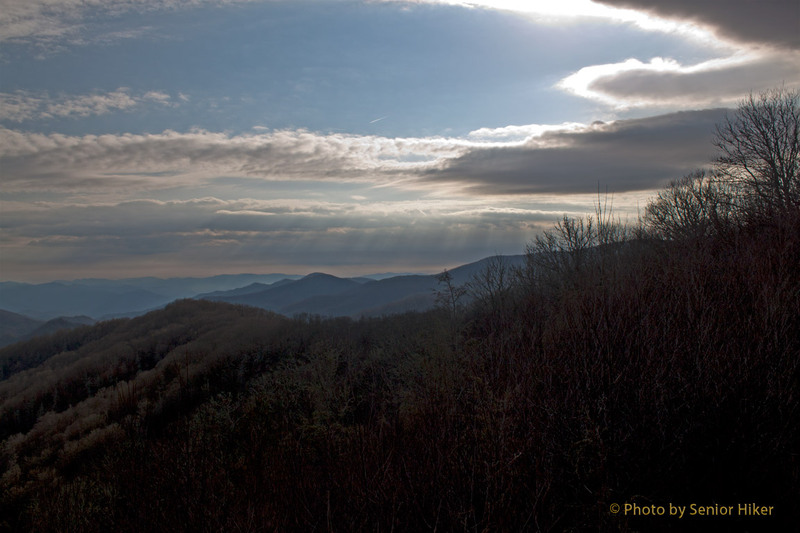 Afternoon sky in the Smoky Mountains, North Carolina. January 31, 2012. A rock slide closed the interstate on the morning Betsy and I were coming home from Asheville, North Carolina. 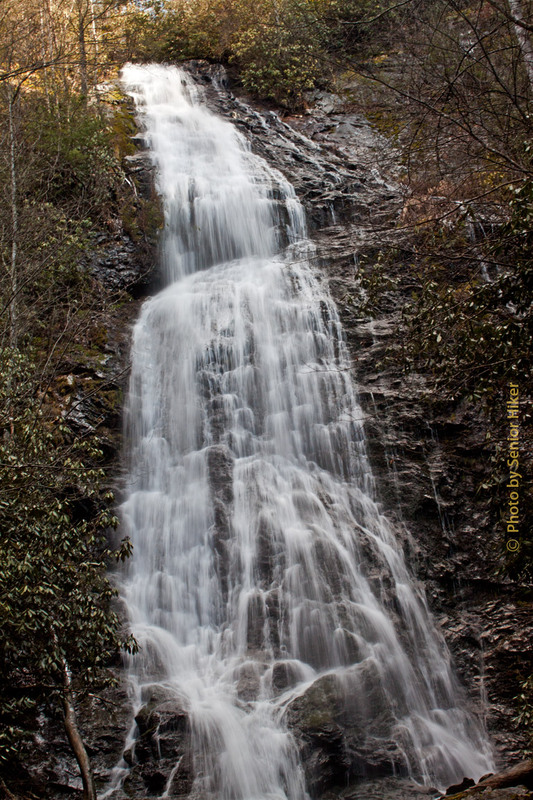 Our choices for alternate routes were a very long detour on the interstates or a drive through the Smoky Mountains. We considered our choices for about two seconds and headed for the Smokies. The day started out with clear blue skies, but clouds developed in the afternoon. I snapped this picture of the sky and mountains at an overlook on Newfound Gap road in North Carolina. You have to look closely, but you can see the sunbeams that attracted my attention. It took us longer to get home than it would have if we had taken the interstate, but the scenery certainly couldn’t be beat.